Have you discovered a successful marketing tactic? Found a way to chisel away a writer’s block? We know our NWU members use all means and ways to refine their craft and promote their work. We’re now asking you to consider helping your fellow writers by teaching them what you know. This is an excellent opportunity to refine a speech you may want to give at large writing conferences in the future. Most of the NWU events are free, but if we do charge admission, you’ll receive a stipend of up to $50. Events are often held in the UAW conference space at 256 West 38th Street, NYC, but we welcome proposals from speakers outside of Manhattan. Also, let us know if you heard a really great presentation at another event and think we should consider that person as a keynote speaker. 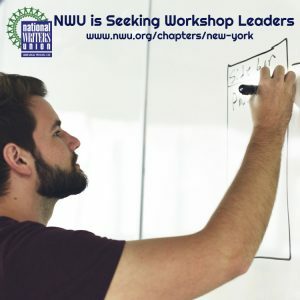 Please send your responses to the requested info below, and any questions to nwuny@nwu.org. Where has the speaker presented this topic before?